GRAND CHUTE, WI - Rob Zerjav, the President and General Manager of the Wisconsin Timber Rattlers, is announcing three promotions and two additions for the Midwest League affiliate of the Milwaukee Brewers front office in preparation for the 2019 baseball season. Hilary Bauer, Lance Kays, and Terry Legarde are all taking on new job titles within the organization. Sam Connell and Kim McGownd have just joined the Rattlers. Bauer, who has been with the team since 2012, steps up to the role of Assistant General Manager along with her current position as Director of Marketing. Also, she will continue in her role as the on-field emcee during Timber Rattlers home games. "Hilary is a proven leader for the Timber Rattlers and has continued to excel in all facets of her position," said Zerjav. "We are excited to elevate Hilary's role with the team as she will continue in her now dual role." Kays is moving from his Box Office Manager position to become the team's Manager of Ticket Operations and Season Sales. "In the two years Lance has been with the Timber Rattlers, he has continued to grow and is well-deserving of an increased role in our ticket department," said Zerjav. "In addition to running the box office, Lance will assist with both season ticket and group ticket sales." Legarde had been in charge of Corporate Banquet Sales & Events since 2016. He will now be the Director of Catering and Banquets for the Timber Rattlers. "Terry has done a great job for us in making The Fox Club a great place for many different events since he came on board. 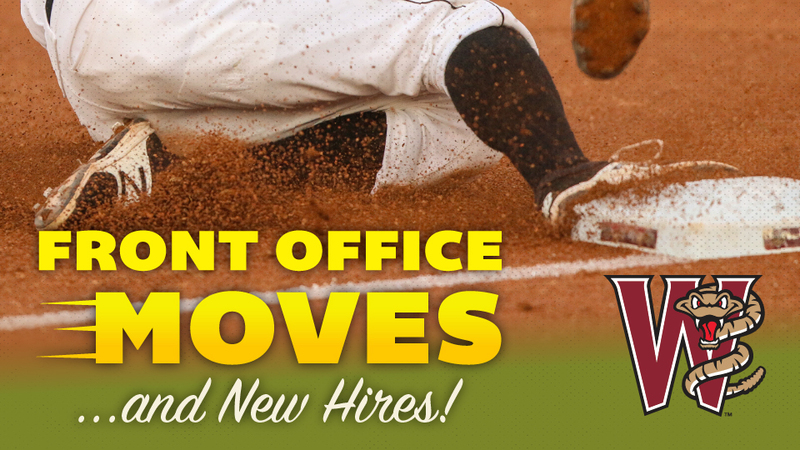 This new position is a natural step for him," said Timber Rattlers Director of Food and Beverage Ryan Grossman. McGownd and Connell are the newest members of the Timber Rattlers front office. Connell joins the organization as the Director of Tickets. "We are pleased to announce Sam's addition to our staff as he comes to us with quite a bit of Midwest League ticket experience, most recently, with the West Michigan Whitecaps," said Zerjav. "The Whitecaps are a first class organization and have been near the top of the league in attendance since they became a part of the league over 25 years ago. We know Sam is going to do a great job for us and we welcome him to our team." McGownd left Stone Toad Bar & Grill in Menasha to become the new Banquet Manager for the Rattlers. "We are excited to have Kim join our banquet staff," said Grossman. "She brings experience in marketing, sales and event planning with her. Kim's time in the customer service industry has made her the perfect fit for the banquet position." The team will begin the 2019 season at Pohlman Field in Beloit, Wisconsin on Thursday, April 4. Wisconsin's home opener is Saturday, April 6 at 4:05pm against the Cedar Rapids Kernels.